EC102 crosses the blood-brain barrier and reduces tau levels in cells after 24 hours. (A) CD-1 mice were injected i.p. with the indicated doses of EC102 and harvested 1, 3, 6, and 24 hours after injection. Brain levels of EC102 were assessed by HPLC analysis. Greater than 50% concentration was maintained for 3 hours with 200 mg/kg without detectable toxicity. (B) CD-1 mice were injected i.p. 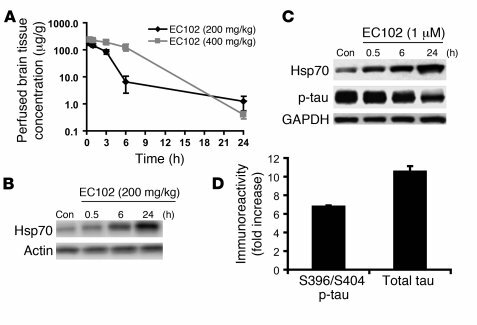 with 200 mg/kg EC102 or equivalent vehicle control (Con) to demonstrate the latency in Hsp70 induction following Hsp90 inhibition. After 6 hours, a slight increase in Hsp70 levels was observed in EC102-treated brain tissue, followed by a robust induction at 24 hours compared with vehicle-treated brain tissue. (C) HeLa cells overexpressing V5-tau were treated with a 1-μM concentration of EC102 for the indicated time points. p-tau, Hsp70, and GAPDH levels were assessed by Western blot. p-tau levels were modestly decreased 6 hours after treatment, with maximal reduction seen at 24 hours after treatment. Hsp70 levels were increased in a time-dependent manner. (D) In-cell Western analysis showed that 60%–65% of total tau was converted to p-tau in HeLa cells 24 hours after transfection with V5-tau.